Continuing their efforts to ensure the sporting equity of the Dakar, which were welcomed by the competitors and the observers in 2002, the organisers' major objective in 2003 is a race where the intrinsic value of each competitor and respect of the rules will be the requirements for success. Having had a huge popular success in 2002, the evening departure will be renewed this year and the departure of the 2003 Telefónica - Dakar 2003 will be given in the evening of January 1st. 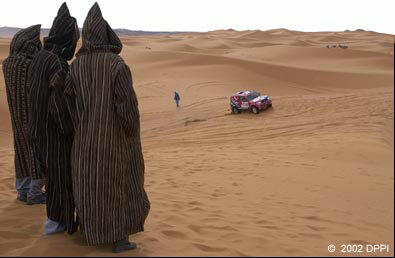 After the crossing of France and Spain, the rallye will join Tunisia on January 5th and will go through Libya, and Egpyt. The finish town will be the egyptian city of Sharm el Sheikh, located on the banks on the Red Sea (January 19th). The organisers wish to limit GPS use in order to return to stages of pure navigation which will allow the competitors to demonstrate their knowledge and their qualities in terms of orientation. Having established the one GPS for all, we innovated once again in 2002 by introducing stages of navigation where GPS were neutralised, authorising only "Cape Direction". This will be renewed this year. A special code will however free the device if necessary, which will, of course, lead to the application of a penalty. 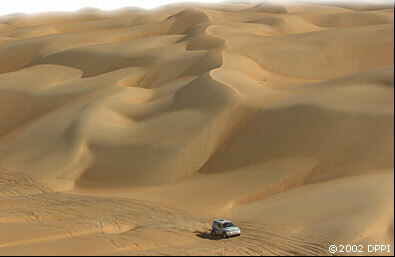 Furthermore, analysis of the route actually followed by the competitors in the desert stages will be systematic and the non-respect of the official itinerary will be sanctioned. In the same way, competitors who wish to use a "Cape repeater" must equip themselves with the model imposed by the Organisation.